Gerbils are small rodents, similar in many ways to hamsters and mice. They are naturally found in the sandy plains of the Middle East, Africa and Asia. Originally known as desert rats, they were commercially introduced to North America and bred as “pets”. Gerbils have long tails that they are able to shed, allowing them to escape predators. Their tails also help them balance when standing on their hind legs. They have sharp claws they use for burrowing into desert sand to escape predators by quickly disappearing under the sand. Gerbils build extensive networks of tunnels and rarely surface other than to find food and water. Over 100 different species of gerbils live in the wild. Most “pet” gerbils are Mongolian gerbils, found in their natural habitat in the 1860s and first captive-bred in the 1930s. Most gerbils are diurnal (active during the daytime), though pet gerbils are often more nocturnal. 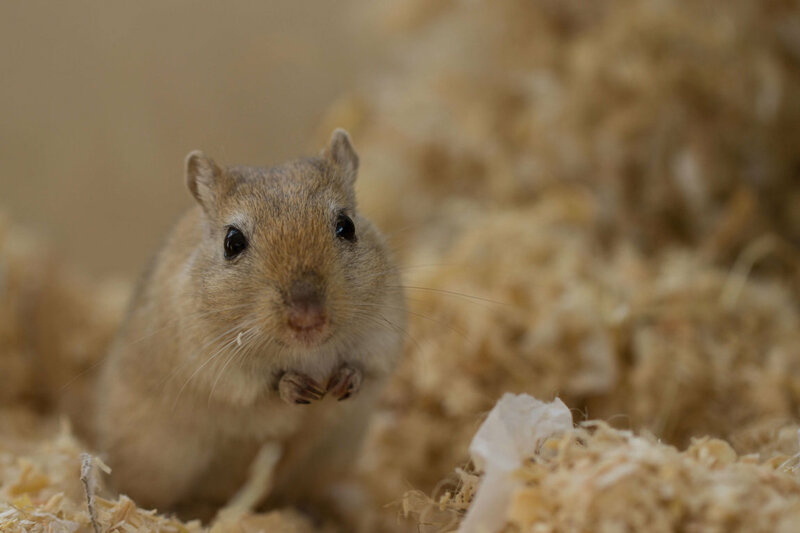 Because of their size, gerbils are mis-perceived as being “low maintenance” animal companions. Gerbils often bite and do not make good companion animals for children. Like all rodents, they can carry rabies and other diseases and, if released into the wild, pose a threat to established ecosystems. If, after carefully considering these factors, you are sure you want to bring these delicate creatures into your home, avoid pet shops and adopt from a shelter or rescue agency. Gerbils do not like to be alone and live in families of up to 20 members in their natural habitat. If kept in a solitary environment, a captive gerbil will become depressed. If you’re planning to adopt gerbils, two males or two females from the same family will bond together. Their dietary needs include a variety of greens, fruits and seeds, some of which are available in packages formulated for hamsters or birds. Their teeth never stop growing, so it is imperative that these animals be provided with hard, digestible items to chew. A large wire-mesh cage with a solid base works best. Colorful plastic cages may be enticing, but they are difficult to clean, and gerbils may chew their way out. You’ll need a water bottle, nonwood-based bedding such as straw or shredded white paper, chew toys and an exercise wheel. Wooden ladders and toilet paper rolls also make great toys. Only use solid exercise wheels for gerbils, since their long tails can become entangled in wire wheels. Do not let gerbils become too cold or they will go into hibernation. Gerbils live for about five years.